We are now home and trying to adjust to our new way of life. We are three weeks post Norwood. 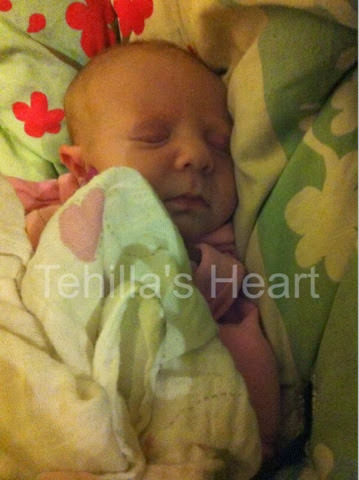 Tehilla's next surgery, the Glenn, will be between age 3 and 6 months. The stage between these two surgeries is called interstage. While the Norwood surgery essentially allows her to live and breath, it comes with its limitations. Please see the page "What is HLHS?" to understand these procedures. Her heart functionality is limited and we have to insure that she doesn't stress her heart out too much. As well, she is immunosuppressant. Her body isn't strong enough to fight much. Even the slightest sickness can quickly turn dangerous and, G-d forbid, even fatal. Because of all of that, interstage can be a very difficult time. Before we left the hospital we were retrained in CPR and given instructions of what to do in various situations. We can not take her on buses or to crowded places. To limit her exposure to germs, we won't be having anyone over at our home, outside of family. It may feel extreme, but it is necessary with a medically fragile baby. Right now, Tehilla is on two medications: Aspirin for her heart, which she will take for the rest of her life, and Fusid, for her urine output. She also has to keep taking Monogan formula for the next month, mixed with some Polycose, to help her gain weight. Tomorrow, we have an appointment at the hospital with Tehilla's dietician, to make sure she has gained weight and make adjustments if necessary. Since we have been home, Tehilla has been getting a lot of love and attention from her brother and sister. She has also been extremely fussy. That's such a Ron face! She's an adorable little girl. Imyirtzeh hashem she will do gr8! Just curious, what type of formula is monogan?